How much would you tolerate? Would you tolerate your cab driver drinking and driving? The passengers in MullenLowe's new hidden-camera PSA for the Safe Roads Alliance certainly don't. 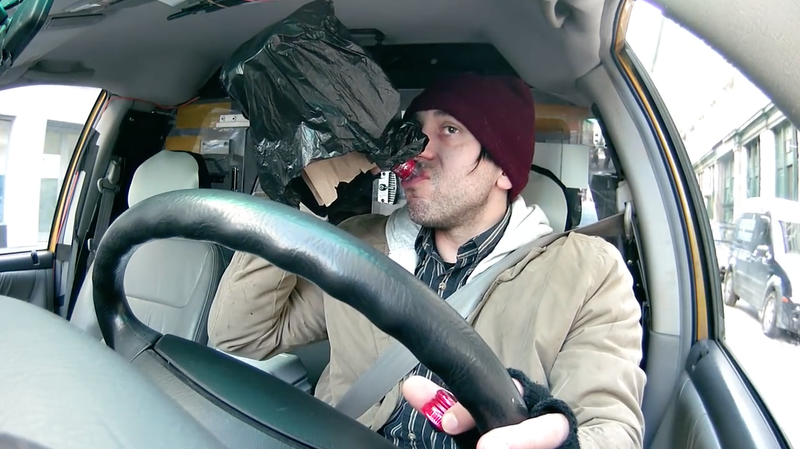 From the moment they see their cabbie taking swigs from cans and bottles (he isn't actually drinking alcohol, of course), they ream him out—and force him to pull over. But only toward the end of the PSA does the real point become clear. MullenLowe launched the video to coincide with National Distracted Driving Awareness Month. The agency has pretty compelling data about the dangers of texting and driving: Talking on a phone while driving increases your accident risk by a factor of four, while texting and driving increases the accident risk by anywhere from eight to 23 times, according to the National Safety Council. The PSA cleverly captures the indifference people feel about texting and driving, versus drinking and driving. "People text and drive. These same people know that texting and driving is a bad idea. Yet, in a classic case of 'It won't happen to me,' they continue to do it," says MullenLowe creative director John Kearse. "Far more people are injured in distracted-driving accidents than drunk driving. Obviously, drunk driving is nothing to joke about, and is something any reasonable person would classify as a terrible idea. Why do we view texting and driving differently?" Kearse said the cabbie's vodka was actually water, and the beers were energy drinks with beer labels wrapped around them. "So the cabbie was very wound up by the end of the day, even though his demeanor remained extremely relaxed. That's some serious acting," Kearse says. And for the record, he wasn't actually texting either. All sounds and "texts" from his phone were pre-recorded video clips that made it seem like he was sending and receiving messages.